Ross wanted to go out for Mexican the other night and our kids have not been the best behaved at restaurants…so I decide we’d have Mexican night at home! We haven’t been out to dinner in a while between Cooper being sick, the weather and struggles with Cooper’s eating lately. I know he’s going through the picky toddler stages and he doesn’t like to sit at the table during dinner….it’s a constant battle almost every night. I used to look forward to sitting down to dinner as a family, but now it’s becoming exhausting and not enjoyable. I know this will pass and things will get better. We’re all just ready for spring and warmer weather to arrive! This casserole was really good! It’s a great way to use leftover chicken and it came together really quickly. It makes a full 9×13 casserole, so you’ll have plenty of leftovers – or it’s a great dish to take to a pot luck party! If you like a little heat, you could always add in some diced jalapenos. Preheat oven to 375 degrees. In a medium pot, combine the cooked chicken with water and taco seasoning. Heat until warm throughout. Prepare the Mexican rice according to the package – I use a Zatarain’s box but will make it from scratch next time I make this recipe. 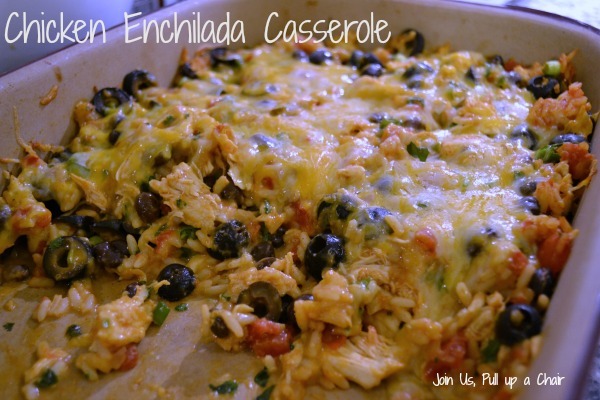 In a large bowl, combine the chicken, rice, olives, green onions, black beans, cilantro, and one cup of cheese. Spread this mixture into a 9×13 casserole dish. Pour the enchilada sauce over the casserole and cover with aluminum foil. Bake for 20 minutes. Remove from the oven and remove the foil. Spread the remaining one cup of cheese over the top of the casserole and bake uncovered for an additional 10 minutes for the cheese to melt. Allow to rest before serving. Use your favorite toppings to finish the dish – sour cream, shredded lettuce, fresh diced tomatoes, or avocado. My family lo-oves Mexican dishes and this is perfect for this crazy cold snowy weather.